News A Group In Taraba State, Invaded The Fulanis, Killing Over 30 Cows! A Group In Taraba State, Invaded The Fulanis, Killing Over 30 Cows! Report gathers that a group which is identified as "Yandang militias" from kasuwan ladi, Nyapuli and others have been accused of allegedly invading and killing over 30 cows that belong to the Fulanis at Abbare town in Lau LGA of Taraba State. down and ransacked Santuraki, Kiri, Katibu and many villages suburbs of Mayo-lope, rendering thousands homeless. 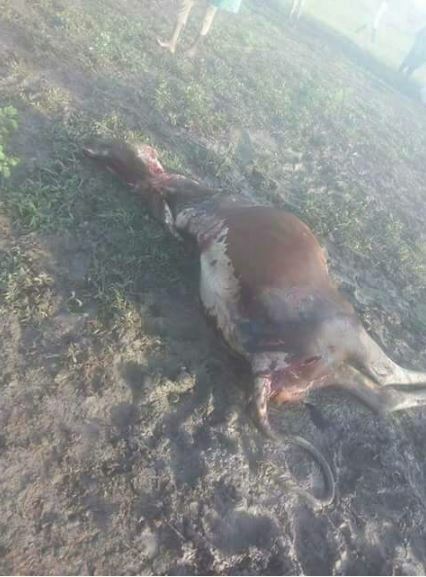 Photos of cows killed was shared using social media as the victims are seeking for justice and also the attention of the media.